Trevor Sondag focuses his practice in products liability defense, with particular emphasis in toxic tort litigation involving asbestos. Mr. Sondag is engaged in all aspects of trial practice; preparing pleadings, arguing motions, taking depositions, obtaining dismissals, reporting to clients, researching law for various jurisdictions, etc. He is admitted to practice in both Illinois and Missouri, as well as the U.S. Court for the Southern District of Illinois and the Eastern District of Missouri. 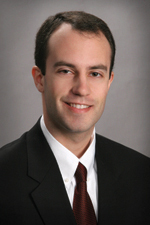 Mr. Sondag joined Hinshaw & Culbertson LLP in January 2008. Previously he was a law clerk at Weilmuenster & Wigginton P.C. in Belleville, Illinois. From 1998 to 2000, Mr. Sondag was an administrative clerk in the Law Office of Michael J. Reagan (now the Honorable Michael J. Reagan, U.S. District Court, Southern District of Illinois).